The Bailey 100 was the fourth stop for the 2016 NUE series, situated less than an hour southwest of Denver on the Platte River, Bailey is in close proximity to the Buffalo Creek trail system and the Colorado Trail. The race serves as a fundraiser for several nonprofits including two youth biking initiatives, Colorado Trips for Kids offering mountain bike opportunities to underprivileged youth and Colorado High School Cycling League which provides riding and race opportunities to high school students in Colorado, the race also supports Colorado Mountain Biking Association which is working to build trails in the Platte Canyon area. Starting in downtown Bailey the route winds its way through the Buffalo Creek trail system and on to the Colorado Trail, consisting of two laps of pristine Colorado single track, racers ultimately covered 106 miles with a whopping 14,000 feet of climbing, with about 70 miles of that consisting of single track. Coinciding with the 100 mile race is a 50 mile distance (the Hundito) which new this season and served as the marathon event for NUE. The weather for the day of the race was looking like it would be a perfect Colorado day, with nothing but blue skies and temps in the 80’s it was shaping up to be a great day of racing. In the men’s 100 mile there was quite a stacked field, with Cohutta and Mohican winner Dylan Johnson, True Grit winner Taylor Lideen and a host of other top end endurance athletes: Cameron Brenneman, Nick Gould, Josh Tostado, David Krimstock, Taylor Ross, and Scott Leonard. In the first few miles of road the pack stayed together, but once the race hit a new double track section the early leaders were quickly established. Jonson and Brenneman jumped to the front upping the pace and chasing 50 mile racers Alex Pond and Mark Currie. Just behind in a chase group of 5 were Lideen, Gould, Krimstock, Ross, and Tostado. Once the race got into the single track, things stayed pretty much the same but with Gould, Lideen and Tostado taking up the chase of Jonson and Brenneman. By the time they reached the Colorado trail the chase group of three were starting to reel in Brenneman, who had been dropped by Johnson who was now pulling away in first place. By the 40 mile mark Lideen and Tostado had dropped Brenneman and Gould who was suffering from back pain. Johnson now had a comfortable lead of about 4 or 5 minutes on the two chasers. At the start of the second lap catastrophe struck for the 4 lead riders when a course marshal sent them the wrong way. They continued in the wrong direction for over an hour before realizing that they could not possibly be going the right direction. They returned to the marshal where they were informed they had been given “bad information.” Now way behind, Johnson, Tostado and Brenneman decided not to continue out of frustration. Lideen was the only one in the lead group that decided to continue and with a huge amount of courage he finished the race in 11th place after almost 120 miles of riding. The new leader of the race was Krimstock, followed by Ross who had also been told to go the wrong way but decided to turn around before he had gone to far. Krimstock powered out the second lap of the course taking the win followed by Eric Bee in second and Ross getting edged out at the line by Scott Leonard for 3rd. In the women’s 100 mile race it came down to two pro women who persevered and finished the grueling race, Christy Olson and Liz Carrington. Liz reported that she didn’t think the race would take as long as is did and that the mileage between the aid stations was a good 5 to 7 mile longer than advertised. The heat of the day took a huge toll on her as she battled through severe dehydration, pushing here bike up some of the steeper climbs near the end of the race. She turned down offers from motorists on the final stretch to the finish line. She wasn’t the only competitor suffering in the hot sun from dehydration today and the medical tent was a full house. Christy Olsen took the top spot with Liz coming in 18 minutes behind her. In the men 50 mile race there were only two pro men, Alex Pond and Mark Currie. Even though there were only two of them, it would be great battle for the top spot. Both 50 mile men jumped out front at the beginning of the race and had only a couple 100 milers with them. When they reached the single track Mark had a slight lead but Alex had him in his sights the entire time. When they reached aid three where they split off from the 100 mile course Alex quickly bridged the gap up to Mark and they rode the burn section together. Just before they got to the final road section Alex made a move to see how Mark was feeling and he couldn’t answer the call. Now riding alone Alex was a little concerned with the lack of course markings, as he had never been on the course before. He saw many alternate routes but he tried to stay on what he thought was the most traveled direction. He finally did get to aid 5 and knew he was going the right way, but again after the aid the course markings were few and far between. Alex had built a comfortable lead by this point but he was still a little concerned with markings, besides the aid stations there were none. When he got to where he knew the finish area should be he saw the turn but the arrow was pointing straight up the road, so he continued on. When he found himself back to the town of Bailey he knew something was wrong so he rode back to the last arrow he had seen. Now there was a course marshal there to tell people to turn, when he finished it had been an extra 20 minutes and Mark had come in already. Mark knew exactly what had happened and in a show of great sportsmanship decided to give the win to Alex. Alex had him beat by a good margin and it was the right thing to do. After a great race between these two it comes down to great sportsmanship. Alex takes the win with Mark in second but really they both came out winners on this day. In the women’s 50 miler Karen Jarchow proved she was the strongest in the field with a commanding win, beating her closest competition by 30 minutes. This is win number two for Karen in the NUE marathon series. When asked about her race Karen said “Pretty uneventful but a solid day, I was climbing better than I was descending, I really struggled to find any flow through the kitty litter and unfamiliar trails. What I lacked in technical skills I made up for on the climbs and came in with a solid lead. I’ve done this race before two years ago and I completely cracked on the final stretch of road before the finish, so this year I tried to stay consistent up until then to be able to drill it back to the finish line”. Rounding out the podium in the women’s 50 was Lisa Hudson in second followed by Becky Edmiston in third. There were good and bad things about this race, first the good. The course is phenomenal, its great Colorado single track in a beautiful setting. The camping and after party was great: great food, good band, and a really fun time. The aid stations were great, all the volunteers at the aids were wonderful, and the bottle hand ups were very nice and helpful. The money that is raised goes to a great cause and it’s easy to get behind something like that. 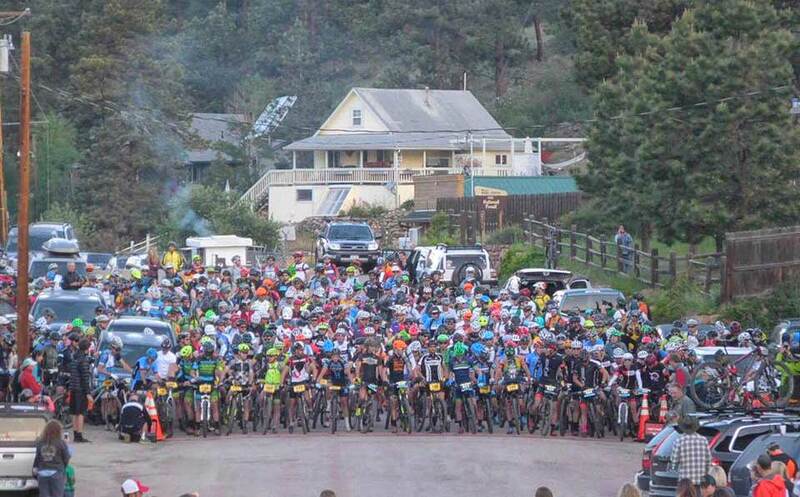 The bad; the course was marked horribly, not everyone racing is from the Front Range and knows the course by heart. Many competitors came from other parts of the state and country and had never been on these trails. 100 miles of trail is a lot of course to mark but there were way too many unmarked intersections and not one piece of ribbon on the entire course. When course marshals are sending racers the wrong way, you have a big problem. I don’t think blame falls on the volunteers because they are just following instructions. The organization starts at the top and trickles down, if there’s a lack of it at the top there will be a lack of it all the way through. Putting one of these races on is a huge undertaking but on the flip side so is training for one, especially for the competitor who look to do only one or two of these types of races. They should get every opportunity to have a great race getting lost isn’t a part of that. Three of the four pros that were misdirected on course were from other states and took the time and effort to travel to the race. Getting sent in the wrong direction by a marshal is unacceptable and is something I have never experienced in over 15 years of racing. The Bailey 100 can and will be a great race, it just needs some fine tuning; hopefully they can learn from past mistakes and make improvements for the future. Thanks to all of my sponsors for this race season!